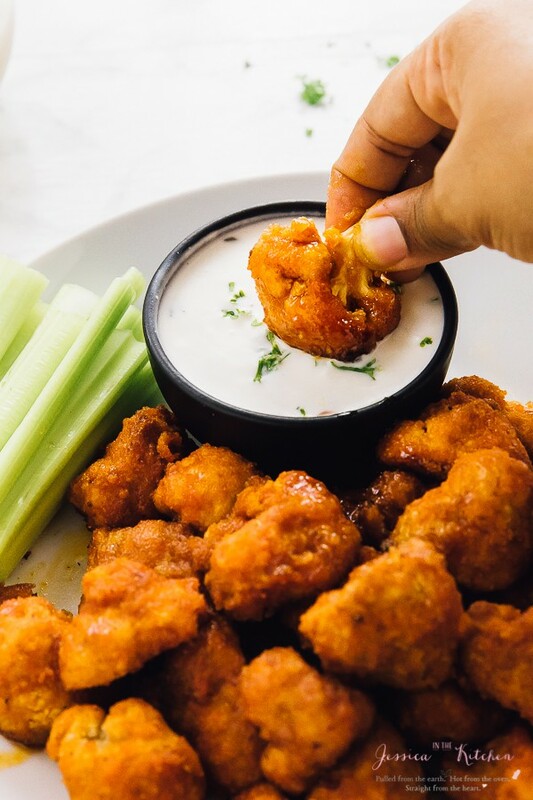 These Vegan Cauliflower Buffalo Wings will blow your tastebuds away!! 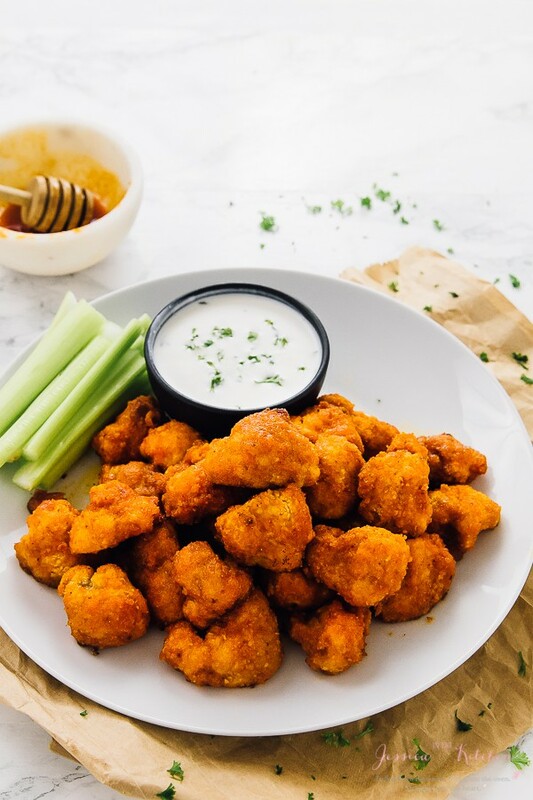 Coated in a sweet hot garlic buffalo sauce, they are unbelievably addictive and the perfect game day snack! FACT: I am a spice lover. Not a little, I LOVE spice. I put pepper on everything: my avocado toast, in my chickpea curry, even in my new favourite cauliflower soup (uh, PSA: you need to try that. It’s been my most quickly reviewed, 100% positive recipe!!). If it facilitates spice, I’m adding it. 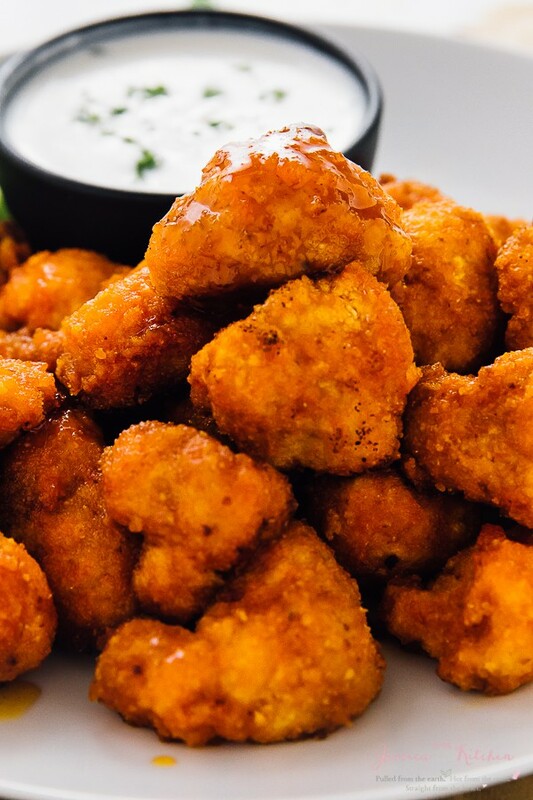 I have made sure that none of the recipes here are at my spice level because I know it’s high, all EXCEPT these Vegan Cauliflower Buffalo Wings. I present: a recipe that identifies with me at my core. Spicy, DELICIOUS, loaded with flavour (SO. MUCH. FLAVOUR) and of course, and quite simple to make. Oh my. 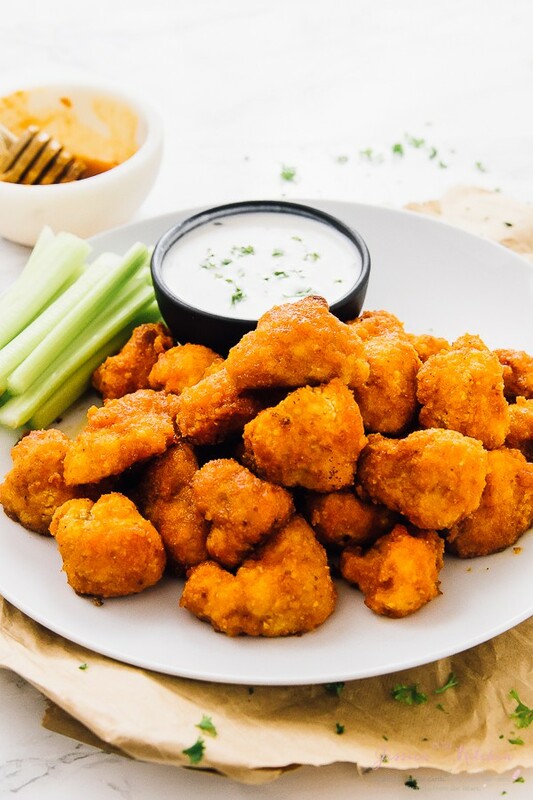 These cauliflower buffalo wings. My eyes swelled joyfully as I ate the first batch sans cooling sauce (#teamfierce) and I enjoyed every bite. This isn’t my first cauliflower wings rodeo, and I’ve made my Sticky Sesame Vegan Cauliflower Wings more times than I can remember. After it was selected as one of the recipes that won 2016/one of the recipes you NEED to try in 2017, I knew I needed to make a new version. A version that you’d not only adore if you’re a spice aficionado, but one absolutely perfect for Super Bowl. Your friends will ooh, ahh, and look on jealously as you devour these. The smell of the sauce is intoxicating. Share with them, it’s the right thing to do. So I’ve bantered on as usual; let’s get to the cauliflower buffalo wings. I used the exact same recipe as I did for my sesame wings, except I used finer breadcrumbs. Traditionally, buffalo wings aren’t breaded at all, but I think it’s safe to say these aren’t so traditional ;). I definitely think the breading is crucial to the cauliflower wings tasting so good, so don’t skip it. After they are baked at a nice high temperature, they take a batch in a sweet hot garlic buffalo sauce. After posting the same picture on my Instagram stories and Snapchat, many of you were in shock that these were vegan. YES my friends, vegan, gluten free and ready to be eaten. Try them: party snack, evening snack, Netflix night and Super Bowl treat. I kept these as healthy as possible with only one tablespoon of vegan butter so feel free to DIG in without any guilt! Q: So, are these wings really spicy? A: YES! Buffalo wings are super hot wings in general. Taste the sauce before soaking your wings in them and adjust them to your heat level if it’s too much. We personally LOVED the heat here. A: Yes! The breadcrumbs makes the cauliflower wings crispy before the sauce goes on. Ideally, you should make them with panko breadcrumbs which I’ve linked to below. I’ve made these without the breadcrumbs and it doesn’t work without the breading. IF you can’t find panko gluten free breadcrumbs, regular gluten free breadcrumbs will work, just toast them first. 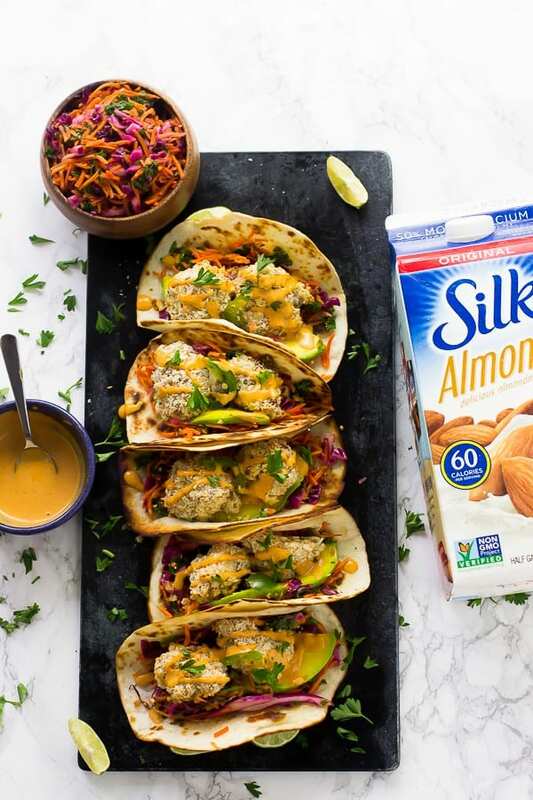 Q: Do you have a vegan ranch dressing to go along with these?! A: Yes I finally do! After you guys asked me about this endlessly, I made a Vegan Ranch Dressing for you to serve these with! Using a knife, remove florets from the cauliflower (aka cut off the leaves and don't use the stems). Remove from oven and serve immediately with a cool vegan ranch dressing (cooling agent is essential!). Enjoy! While the wings are baking, in a small pot over high heat, mix all the sauce ingredients. Bring to a boil and boil for 2 to 3 minutes, which helps to bring out more flavour notes of the ingredients. Remove from heat. Taste a little bit to decide if you need more sweetener to balance out the heat; if so, add a tablespoon at a time until your desired heat. Please note that especially depending on the hot sauce you use, these wings are HOT so take caution! Don’t use olive oil to grease the baking sheet since it will burn the bottom of your wings. 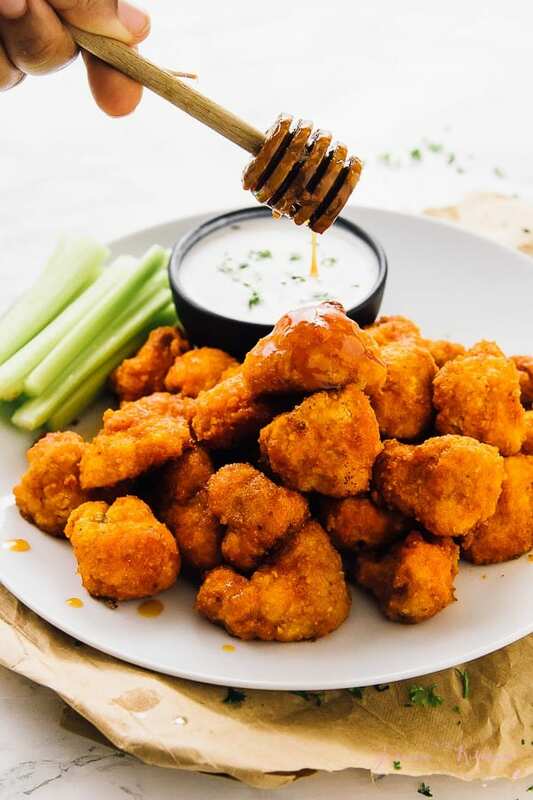 The batter will only adhere to the cauliflower wings dry. So, if for any reason you wet your cauliflower, it has to be 100% dry for the batter to stick. You can use regular or whole wheat flour if not gluten free. Some Gluten Free flours are thicker than others, so if your batter seems way too thick, add in a few tablespoons of milk to thin it out a little if necessary. I use Bob’s Red Mill All Purpose GF (NOT Baking) Flour. I have used Einkorn flour while making these and it is a beautifully smooth consistency and is naturally organic. cauliflower wings? OMG I think I just died and went to heaven! These look insanely delicious! I love spice too, although I need it in moderation! 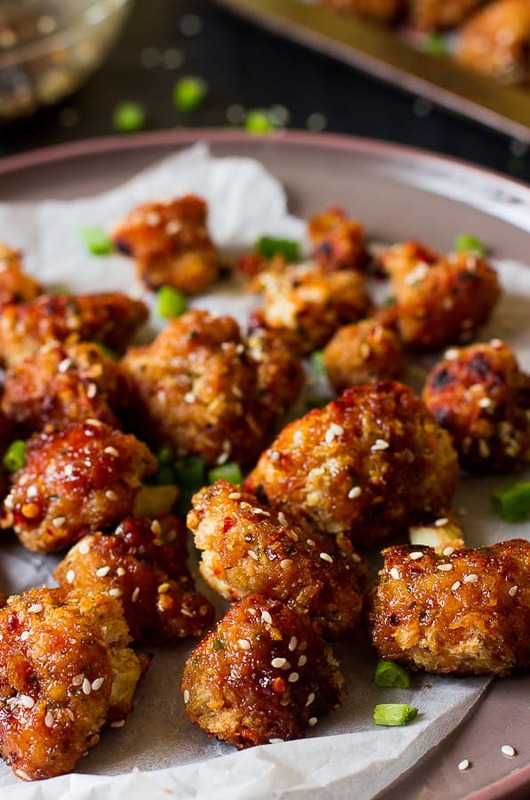 But, I have a feeling I would devour these cauliflower wings in no time. They look SO pretty, Jessica! And so good too…what a perfect game day snack! Thanks Gayle! Yes they are spicy, and definitely the perfect game day snack! Thanks Ashley!! Yes that was totally me. What is that dipping sauce you have for the cauliflower buffalo wings? 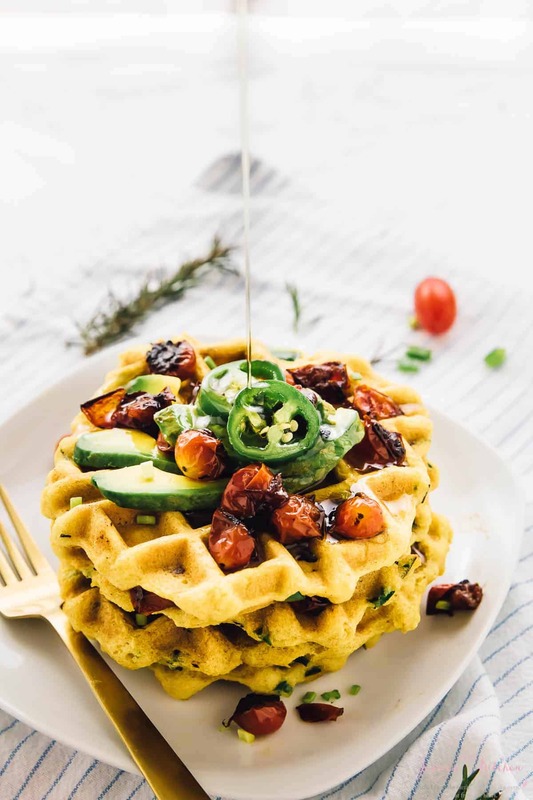 I would love to make that along with the recipe-this looks so delicious! Also, thank you!! I hope you enjoy! So happy to hear Javier! Could I go without breadcrumbs? How essential is it? Haha I hope it helped! Oh OOPs, forgot to write that instead of hot sauce i made a vegan butter sauce adding vegan Parmesan & a little lemon to dip the artichokes in. Oh sounds so good Julie!! I’ll need to try that. Love the dip you made too! This was an AMAZING recipe. Truly the best cauliflower wings recipe I’ve tried so far. I found that cooking the cauliflower florets on the stove on med-low heat for about 10 mins and then squeezing out any remaining water made the cauliflower crispier. The addition of bread crumbs really makes it feel like I’m eating actual wings, as well. I substituted your sauce with something a lot more mild, but I found that a 1/2 cup of sauce, like you have in your recipe, is actually the perfect amount needed to coat one tray of wings without losing the crunch of the coating. This is definitely my #1 go-to recipe whenever I’m in the mood for it. Thank you so much for this recipe! Yay!! So happy to hear Rose!! Thanks so much for sharing your changes and your feedback!! You’re SO welcome!! These were delicious. Nice and spicy, and had a great crunch. Will make them again for sure. They are so good, but I am a woos. I cant handle the heat. Any suggestions for sweet and sour or garlic Parmesan? All, I have a question. These tasted great and I highly recommend them. However, I baked them after battering as directed and the texture was great. Then I put the buffalo sauce on and baked them for 5 minutes more. They were a little soggy- nothing horrible but I noticed. Do you think baking them for more time would have made them soggier or crisped them up a little more? Thansk for your thoughts! So glad you enjoyed!! Hmm, ah I’m not sure they ended up soggy for you but I’m sorry to hear that!! Next time maybe try them straight out of being dipped in the buffalo sauce and see if you prefer them that way. I hope that helps!! These are awesome!! I didn’t have any panko so I whizzed up some oats in the food processor and used those instead and it was amazing! Keep this up your recipes are fab!!! OMG these came out amazing, my date loved them to death. Even mentioned on becoming vegan! Yay I’m so happy to hear that Javier!!! Thanks for sharing with me!! Love this. Been looking for more ways to cook cauliflower and I’ve been stuck. Can’t wait to try this out. Check us out for boiler cover liverpool tips and advice. Made these and turned them into wraps, sooooo good! Made them again today, SO good! Yay!! So happy to hear Pam! 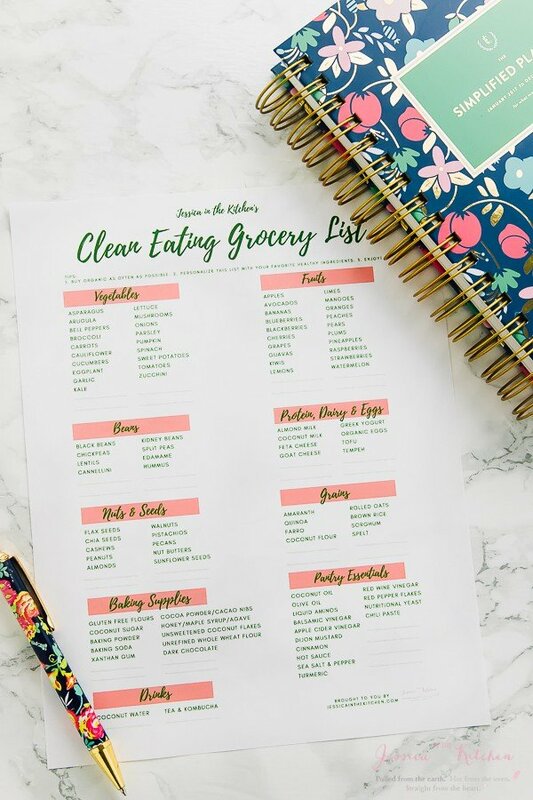 Recently started to my transition into adapting a vegan lifestyle. When I came across this recipe, it had to be the first vegan dish I made. …1st time was good. 2nd time was better. I already like cauliflower but man the THIRD week in a row I made these, it SMACKED!!! Thank you for this bomb recipe. It has really encouraged me to try new things & look forward to giving vegan recipes a try. Going to try the tacos in the near future! Oh I’m SO happy to hear this!! I just made a new flavour today – sweet and sour, so can’t wait to share that! You’re so welcome and thank you again for your incredibly kind words!! God, this is delicious. Turns out there’s not vinegar based hot sauce in German supermarkets so I used spicy barbecue sauce instead. I needed more than the amount in your recipe but it was soooooo delicious. Thank you SO much for saving me from a desolate, cheer- and wingless life (kidding, it’s actually pretty great, but still, spicy wings!!!). Haha! Thank you Ruth we’re so happy that you enjoyed our cauliflower wings! Thats interesting about the hot sauce options in German Supermarkets, Spicy BBQ sounds like a great choice in substitutes. I just made these for my husband and I, and we both absolutely loved them! They’re crispy, but “meaty”. We do like spicy food, so we might just be used to eating it but they were a perfect amount of spicy. Amazing recipe! Would recommend. Hi Morgan. We’re bursting with smiles at this comment thank you for your kind words! We’re glad that both you and your husband enjoyed them!!! Thanks so much again for your comment! I made the buffalo wings, gluten free, and they were yummy! I made the mistake of using an olive oil spray 🤦🏻‍♂️. They were kinda soggy, I was thinking of next time broiling them. How do you toast your bread crumbs? I’m so happy to hear and yes, no to olive oil, it just doesn’t work here for some reason and will definitely cause that sogginess. I toast my breadcrumbs in my toasted oven. I spread them out and toast them like I would a slice of toast. Makes it very close to panko breadcrumbs. I hope that helps!! These Cauliflower “wings” were outstanding! We were surprised at how chewy and crispy and wonderful. I would recommend to everyone! Aww thank you so much that means so much!! 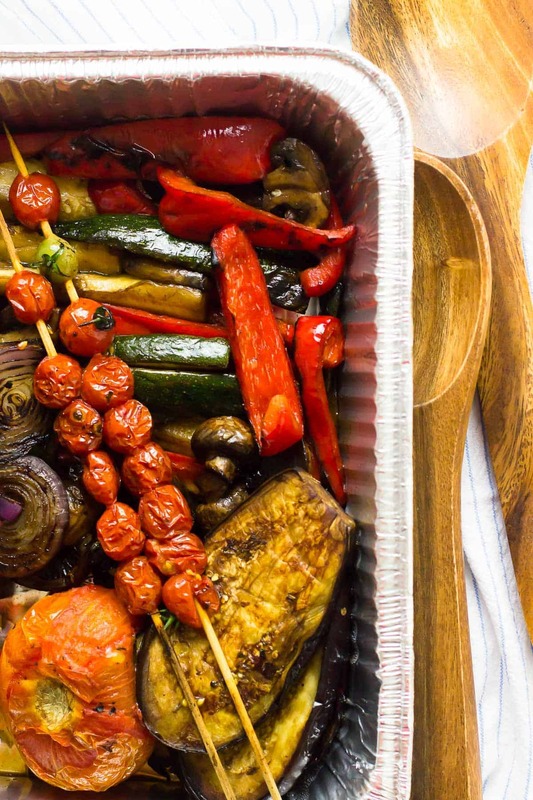 Omg I found this recipe on pinterest and made them for a family picnic….. Wow! They were such a hit, very spicy but so so good. I did change the recipe a little by adding some fig, onion and balsamic jam to the maple hot sauce and some gluten/dairy free corn flakes into the bread crumb and it was so good. Aww I’m so happy to hear that!! That jam sounds divine and like the corn flakes idea! You’re so very welcome!! I used the hot sauce. It looks like the buffalo sauce has all the additives in, so if you’d rather use that you definitely can use it in place of the entire sauce! My sauce has a little bit of a sweet and spicy so you can amp it up the way you desire! I hope that helps, and that you enjoy!! I used a large head of cauliflower and 1.5x all the batter and sauce ingredients. These were sooo spicy but good. I’m glad I served them as an appetizer though! Awesome Haley! We’re really smiling at this review. Thanks so much for reading!